Former Sunderland boss Gus Poyet is 'interested' in the vacant manager's post at Swansea City. The Swans may compensate Poyet's current club AEK Athens if he succeeds Garry Monk, who left on Wednesday after one win in 11 league games. The club wants to name a new manager before the Premier League game at home to West Ham on 20 December. Swansea's caretaker manager Alan Curtis is in charge for Saturday's league game away at Manchester City. 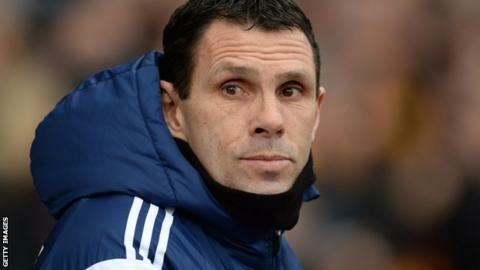 Poyet is the bookmakers' favourite for the Swans role, although former Wales winger Mickey Thomas believes Manchester United assistant manager Ryan Giggs would be interested in the vacancy. Other potential contenders appear to have been ruled out. David Moyes, sacked by Manchester United and Real Sociedad in the last 20 months, is not interested in replacing Monk, while ex-Swans boss Brendan Rodgers is reportedly eyeing up other opportunities. Poyet only went to AEK Athens in late October, having been sacked by Sunderland seven months earlier. The 47-year-old former Uruguay midfielder, who previously managed Brighton, had been linked with Aston Villa's vacancy before joining the Greek club. Poyet, who played for Tottenham and Chelsea in the Premier League, was reportedly close to landing the Swansea job when Brendan Rodgers was appointed in 2010. AEK are second in the Superleague, 10 points behind leaders Olympiakos, and have won four of their six matches since Poyet took over. Meanwhile, Ostersund FK's chairman Daniel Kindberg says he has not been contacted by Swansea regarding their manager Graham Potter and it would surprise him "massively" if he left the Swedish club for the Liberty Stadium. Former York full-back Potter had emerged as a surprise contender to replace Monk, but Kindberg does not think he is likely to replace Monk. "Swansea haven't been in contact with me," Kindberg told BBC Wales Sport. "Graham Potter is highly regarded in Sweden and in Ostersund. "He has become a good friend of mine, someone who I respect massively and we are not finished yet with our project here. "It would surprise me massively if he went, even though I know the Premier League is the best league in the world." Potter has been in charge at Ostersund for four years and last month secured their promotion to Sweden's top flight for the first time in their history. "I would have a long, long discussion if he approached me on this matter," Kindberg added. "He hasn't done that so far."